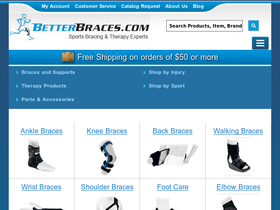 Better Braces, online at betterbraces.com, is the online shop for braces for injuries. Better Braces offers amazing deals on braces for injuries. Better Braces carries ankle braces, knee braces, back braces, walking braces, wrist braces, shoulder braces, foot care, elbow braces, leg supports, thumb supports, head braces, neck braces, hot & cold therapy, muscle stimulators, electrodes, therapy products, and crutches. Check out RetailSteal.com for the latest Better Braces discounts, Better Braces promo codes, and Better Braces coupon codes. Better Braces offers shipping promos that change often. Stop by RetailSteal.com for the latest Better Braces shipping special offers. Better Braces offers standard and express shipping options. Better Braces ships to the United States. Use this coupon code online at BetterBraces.com and enjoy a 20% discount plus free shipping on your entire order! Shop at Better Braces and enjoy free shipping on any order. Click here for code. Shop at Better Braces and enjoy 20% savings on DonJoy Reaction WEB Knee Braces. Click here to shop. Shop at Better Braces and enjoy free shipping on orders $50+. Click here to shop. Shop at Better Braces and enjoy exclusive promos with email sign up. Click here to shop. Shop at Better Braces and enjoy a 90-day money back guarantee on all orders. Click here to shop. Shop at Better Braces and get Knee Braces for as low as $9.99. Shop at Better Braces and receive 25% off when you enter promo code. Enjoy 20% off on DonJoy braces from Better Braces with this coupon code!